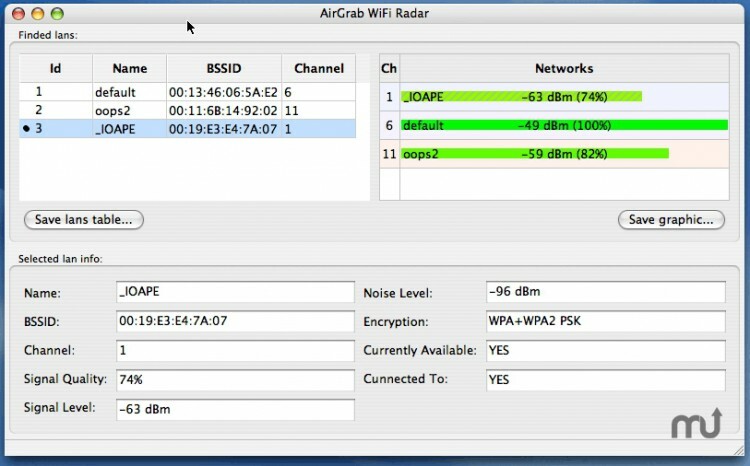 Using AirGrab WiFi Radar you can determine most popular WiFi channels and select optimal channel for your WiFi network. Signal level and Noise level helps to diagnose common wireless network problems and optimally position your base station and or computer to achieve the best possible signal strength. Encryption status of network shows WEP, WPA, WPA2 modes of all immediately available WiFi networks. Graphs WiFi connections statistics: signal, security, noise, SNR, transmit rate, and comm quality. Logging Of All Encountered Access Points. Mac Universal Binary and Intel Optimized binary. Stats About Currently Connected Wireless Network.